So the whole family is coming for dinner and you want things to be perfect – the food, the music, the decor… everything. Where to begin? Don’t worry, the Kenton County Public Library has you covered! You should finalize your Thanksgiving menu about one week in advance. So shoot for a final menu on Thursday, Nov. 21. 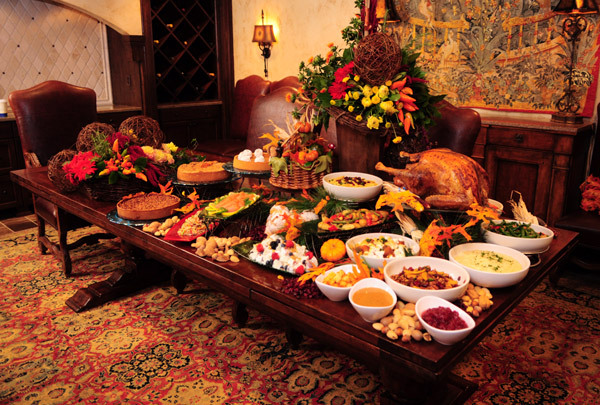 My Thanksgiving menu is set with traditional items like turkey, cranberries, mashed potatoes, gravy, dinner rolls and stuffing followed by pumpkin and apple pie. 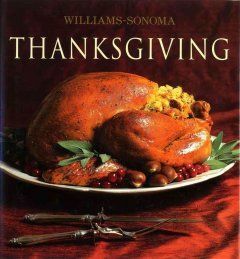 But I like to liven things up a bit each year by picking a new stuffing or cranberry sauce recipe or even something new all together from one of the thousands of cookbooks that can be found at the library. This year I will glance through Thanksgiving: how to cook it well by Sam Sifton, 2012, The pioneer woman cooks : a year of holidays : 140 step-by-step recipes for simple sumptuous celebrations by Ree Drummond, 2013 and Fine Cooking Thanksgiving cookbook: recipes for turkey and all the trimmings by editors of Fine cooking magazine, 2012 for new ideas. You don’t want your guests bored prior to dinner, dozing off after dinner or dreaming about Black Friday shopping so liven the place up with free music and movies. Freegal and Hoopla are always available on the library’s website, even when the library is closed. They don’t have waiting lists or holds either! All you need is an Internet connection and a Kenton County Public Library Card. You can download three free songs per week from Freegal so start stocking up now! Your music doesn’t have to be Thanksgiving themed. Just something fun and upbeat. The top downloaded songs at the Library are currently Walk Off the Earth – Royals, Daughtry – Waiting for Superman and Sara Bareilles – Brave. The top three albums include Justin Timberlake – 20/20 Experience, Carrie Underwood – Blown Away and Miranda Lambert – Four the Record. Another great thing about Freegal is you get to keep the songs forever! Hoopla allows you to check out books and movies, with a total of eight items a month. Katy Perry – Prism, Pearl Jam – Lightning Bolt and Luke Bryan – Crash My party are three of the hottest albums on Hoopla right now. You are able to keept he item for one week. And if you need to entertain the kids at your dinner party, break out Tale of Despereaux, Lego Movie: The Adventures of Clutch Powers or Ivan the Incredible. All three are available on Hoopla and have no wait! Seasons of Giving or Alvin and the Chipmunks: Alvin’s Thanksgiving Celebration. The library carries all three, which you can put on hold. Some good books to have lying around for the kids include I Spy Thanksgiving by Jean Marzollo and Walter Wick, Molly’s Pilgrim by Barbara Cohen, Over the River and Through the Wood: The New England Boy’s Song About Thanksgiving Day by Lydia Maria Child and Sarah Gives Thanks: How Thanksgiving Became a National Holiday by Mike Allegra. These items can also be put on hold at the website. Martha has you covered in “Good things for easy entertaining” from the editors of Martha Stewart living. We also have some super cute ideas on our Thanksgiving Pinterest page. My biggest advice is to think outside of turkey and pumpkins, unless you want to go that route. I like to think fall in general. I’d like to go with an orange, red and brown color pattern. I might wrap a nice candle in cinnamon sticks. It will add a nice fall smell and be pretty to look at. Let the kids contribute by decorating with crafts they make. 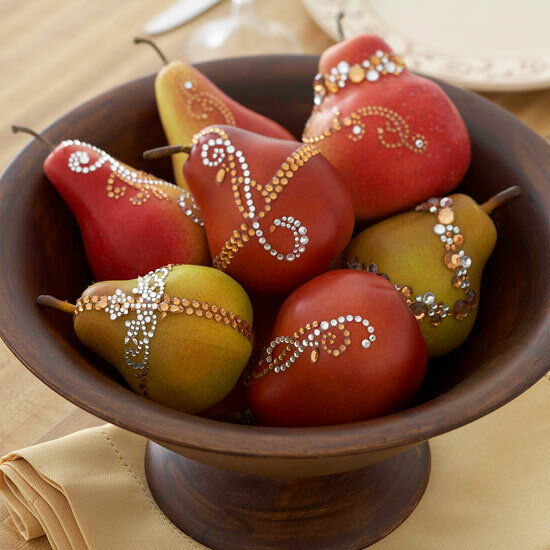 You can create a great centerpiece with fall flowers or by dressing up fall fruits. The holidays are a great time to connect with family members and start writing down your family history. Take a few minutes during on Thanksgiving to ask your family about your history and write it down. Should you or anyone else in your family want to get started tracing your family heritage, having this information will make the initial search much easier. Be sure to take lots of photos at family gatherings so you have something to always remember them by. This photo was found in our Faces & Places database. 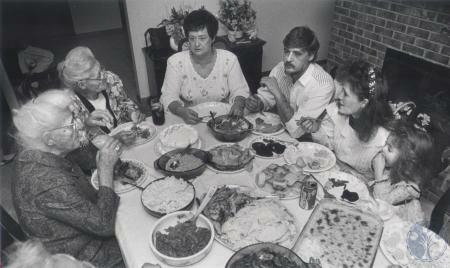 Take a few minutes to research the Library’s Faces and Places database before your big dinner. You might find photos of your own family there. 6. Enjoy your day and if you still need ideas, visit our Pinterest Page!